The Trust Quotient assessment, or TQ for short, is the metricized form of the Trust Equation. It is our tool for defining and measuring personal trustworthiness, thereby allowing it to be managed. The TQ has been taken by over 70,000 people to date, and thoroughly tested over several years. Careful analysis of the data offers up many insights: patterns of trustworthiness across demographics, personality traits of differing combinations, as well as the straightforward measurement of trustworthiness. The Trust Quotient allows you to put a value on trustworthiness—but even more importantly, to understand the variables that impact trustworthiness. Talk with our Diagnostics Team today! The Trust Quotient Assessment allows evaluation of trustworthiness at the individual level- as well as the aggregated trustworthiness of a department, team members, or organization. We put the Trust Quotient Assessment to the test in 2010 by doing a comprehensive study on over 12,000 respondents. This study is the largest ever on the subject of trustworthiness, and the findings bring some much-needed definition and texture to the broader dialogue around issues of corporate ethics, integrity and trust. Women rate themselves as more trustworthy than men, by moderate but statistically significant levels. The gender differences are instructive: the biggest difference comes in the factor of intimacy, where women rated measurably higher. Respondents report becoming more trustworthy as they get older. Improvement showed almost equally across all four elements—increasing credibility, reliability and intimacy, while decreasing self-orientation. Trustworthiness doesn’t vary significantly between industries and job functions. Broadly, jobs that require high personal interaction tend to rate higher. Higher scoring industries include medical care, retail banking, real estate, and consulting. The data underscore that trustworthiness is a personal attribute, distributed broadly across industries. It also suggests a large opportunity—no matter what industry you’re in—to differentiate yourself and your company by focusing on the development and constant improvement of trustworthiness in your organization. Reliability is the most common strength. Overall, 53% of respondents identified reliability as the highest (or tied for highest) component. People with more consistent scores across the four components of the Trust Equation tend to have higher Trust Quotients. This suggests the importance of integrity—we do not trust those who seem erratic or inconsistent. 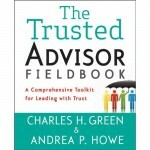 An even blend of the four trust components is more effective than being off the charts in one or two areas. Credibility, in the sense of credentials and skill mastery—the factor on which most organizations put a premium—is the least helpful in building trust. More skills training simply won’t build trust relationships. Intimacy skills, however, can be quickly taught and offer the best path forward for most organizations to make a real and sustained impact on the trustworthiness of their people. Most organizations, however, do little to develop the intimacy skills of their people—a missed opportunity. Ironically, they often reject the power of intimacy skills because they believe “hard data” is more persuasive. Here, finally, is hard data that proves the relative ineffectiveness of hard data. Building a culture that helps individuals lower their self-orientation involves focusing on the long term and working collaboratively. This also helps in building trust relationships, both with external clients and among team members. Trust can be taught. Conventional wisdom in business says to focus on your strengths. While this makes sense in areas of skills mastery, the opposite can be true with trust. By focusing on weaknesses, individuals can make disproportionately large and rapid improvements in their trustworthiness, because improving weaknesses has the effect of lowering standard deviation, thereby increasing perceived integrity.